"I just wanted to thank you guys for an amazing experience. My fiancé Joe recently purchased a ring from you, and I am in absolutely in love with it! From looking online, to picking the ring out, and then picking it up, the whole process was fantastic." "Received my GORGEOUS NECKLACE yesterday. I adore it. One thing I must say about your website is the photographs that are taken are so wonderful on their own to show the piece..all sides..etc..but when you actually receive the item, it's even that much more beautiful." "Thanks so much for your help. I love this ring and will treasure it for the rest of my life!" "I wanted to express my happiness with my “new” ring. It is absolutely lovely. It is very close to my Grandmother’s engagement ring which she gave to me and was lost. Besides being gorgeous, this ring reminds me of my Grandmother and her love and will bring me pleasure throughout my life." Thank you very much, Kathleen A. "Thank you for all your help. She loved the ring!" "I am the very, very, very happy recipient of the phenomenal Edwardian heart-shaped diamond ring! I must thank you for role in making this exquisite piece mine. Nat may have shared with you that I have "stalked" your website regularly, sometimes just to mentally escape amid the beauty of period jewelry. We had talked of visiting the store again when next we travel to San Francisco, however in the meantime I am over the moon with this gift from Nat, the person who always makes me feel over the moon and I truly appreciate the excellent service you provided to him." Many thanks again, Sarah G.
"You made our wedding experience so wonderful. She loves the ring!" "As if by magic, the ring fit Joelle's finger perfectly. She said "absolutely" when I asked, and she really loves the ring. She described it as the perfect ring. Thank you again for all of your help. I really felt taken care of when we spoke on the phone, and the ring looks even more beautiful than it did online." "Thanks again for all your hard work, Kahlia was over the moon with the ring. She also given more than a few recommendations to Lang Antiques." "The rose cut diamond ring arrived today and it is a beauty!... It is my 60th birthday present. I have a wonderful husband, but he is not a jewelry person, so he told me I could get what I wanted. I am so glad I stumbled onto the Lang Antiques web site and I will tell other people when they see my ring and fall in love with it!" "I bought a beautiful ring from you guys in 2009 and I still treasure it. I’ll never forget how kind and helpful your associates are! They helped me choose among rings (I am on the East Coast and purchased via Internet) - even trying them on themselves and giving me genuine advice. The best of both worlds - the breadth that the internet allows, with the personal care of someplace 'local.'" Thank you 5 years later!! Patrice S.
"Just wanted to let you know I received my beautiful diamond ring this week and it is the ring of my dreams! I have been in the market for such a ring for so many years. I have been married 27 years and it was my husband’s gift to me for getting our last child off to college. I have been a fan of Lang Antiques since I first discovered them online years ago. Last month was my first time to visit the store, which is somewhat of a museum of antique jewels! Such helpful and knowledgeable service, what a pleasure. I am overjoyed with my new ring." thank you so much, Kathy O. "The ring arrived and it is a perfect fit. The jeweler did a fantastic job to create a seamless look on the backside of the ring. Once again, I want to thank you for all the work you put into Janet's ring. This was a major purchase for us and I had my trepidations purchasing the ring online, sight unseen. Your professionalism has been awesome. I look forward to expanding our estate jewelry collection the future." "Just wanted to let you know that it arrived today and it's absolutely perfect! The box it came in is amazing as well! Thank you so very much for being so helpful and for your great service!" 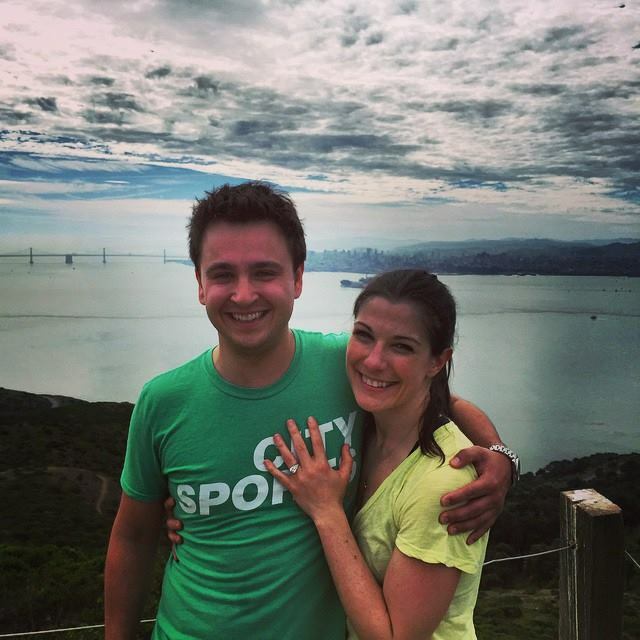 "My ring was delivered yesterday and it is absolutely amazing! The jeweler did a wonderful job at resizing the ring, the pattern on the band looks completely uninterrupted! My whole experience with Lang was wonderful. The process was so fun! I look forward to wearing my gorgeous antique ring and handing it down to our future children/ grandchildren." "Lindsey loves her ring & I caught her sending pictures of it to her friends telling them how beautiful she thought it was… loving the fact that it was beautiful, unique & historic. The smile it put on her face was priceless. Thank you so much for taking the time to answer my questions & help me regardless of whether you knew if I was going to purchase or not." "Thank you for keeping me so well informed! I’ll be singing the praises of Lang Antiques here in Ireland so expect some more orders from this side of the Atlantic!" "I just wanted to let you know that my ring arrived safe & sound. It is absolutely stunning in the 'flesh' and the resize is perfect! I also wanted to take the time to thank you for all your help during my purchase. You were very quick to answer any query I had which helped to make my first shopping experience with Lang Antiques a great one. I also wanted to let you know that I absolutely love the way you photograph your pieces. I like that I get to see all angles of an item, as well as how it looks being worn. Your shop is fantastic and I will purchase from you again in the future." "Hi, I wanted to let you know my ring arrived here... in one day!! It was beautifully wrapped and placed in a nice box… then expertly packaged for shipment. You have far surpassed my expectations and I am thrilled with my new ring! Thank you for sizing it to fit me and for being simply a first class company. My ring is in pristine condition ..and all your jewelry looks beautiful and appears to be very high quality. When I called and spoke with Alison, she was very helpful and friendly. It's been just a great experience start to finish. Thank you very much!! " 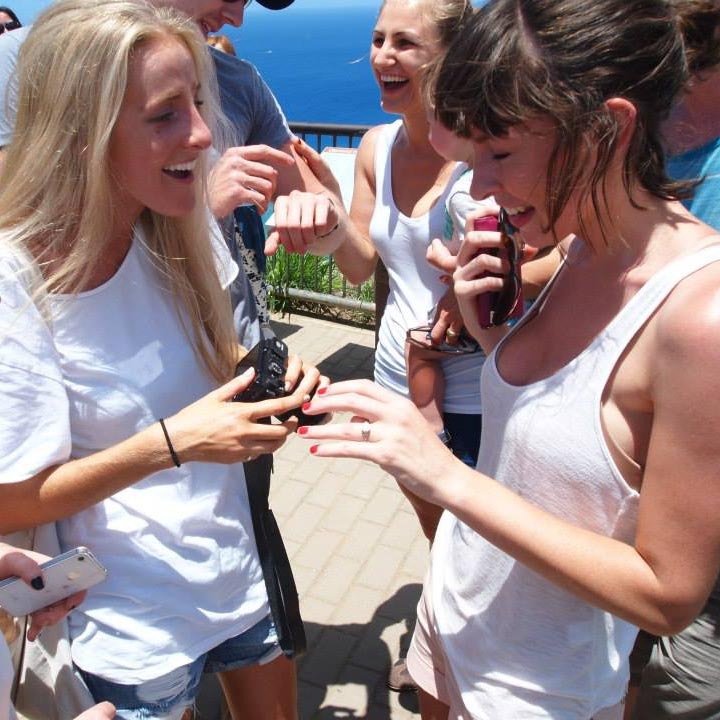 "I've received the ring… it is more beautiful than the images the camera managed to capture. Thank you for making arguably the most important purchase of my life, a smooth one. I have already highly recommended you to everyone I know. Well, everyone that can keep a secret- I still have a week until the proposal. After that, I'll be sure to spread the word on your amazing store." "Wow!!!! I love the ring – it’s a real stunner & it’s everything and more than I expected. I’m absolutely thrilled. It’s no surprise that in the end my beautiful engagement ring came from Lang’s as it’s such a unique store with amazing “one of the kind” pieces. The size is also perfect as well! Thanks for all your help in the delivery and follow up & I hope to come in soon on my next SF trip & show off this beauty!" All the best, Robin R.
"I received my beautiful ring yesterday. I am in love with it! Also, the presentation was more than I expected. I savored every moment of unwrapping my sparkler. Thank you for your help with this purchase." 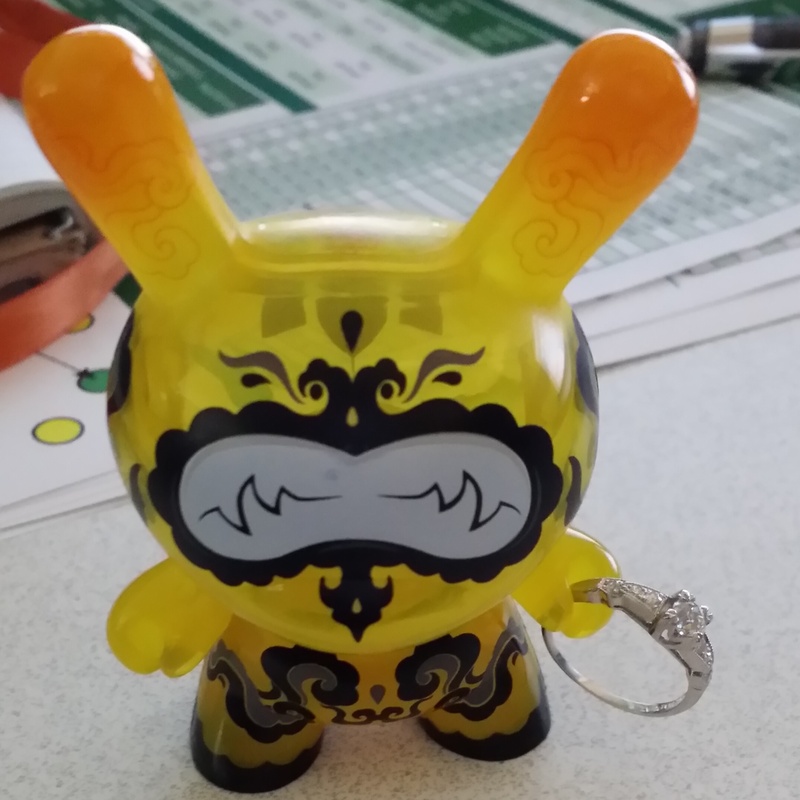 "I received my rings today and wanted to thank you for sending them. Having to avoid San Francisco traffic/parking was a real plus for us. I couldn't be happier with my beautiful anniversary present, and wanted to extend my thanks to you and several people at Lang starting with Suzanne who so graciously assessed my jewelry for trade. The pieces I parted with were all loved family treasures and it wasn't easy separating from them, but Suzanne gave me the time and patience I needed to finally do so. Thank you, Suzanne. Alison was also very generous with her time in corresponding with me and taking various pictures which helped me tremendously in making my final decision. These photos have kept me going while I waited for them to arrive today. Thank you, Alison. And finally, but very importantly, I want to mention Cynthia. On two occasions did my husband and I have the pleasure of working with her. Cynthia was instrumental in helping us make this decision. She was so superbly knowledgeable, and sweet about the time it took to finally make the decision....a decision she guided me to with her inimitable kindness and patience. Cynthia, it was the right ring, and you knew it before I did. Thank you so very much. My only regret is that anniversaries come but once a year! Thank you, all. We will be shopping with you again." 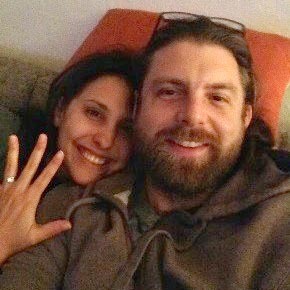 "I have had my engagement ring for about a month now and I wanted to send a big thank you note to you all for your help and guidance in getting this ring to me from an online order and back and forth across the country. It’s perfect for me and my fiancee loves it!! I've been getting a lot of compliments on it and it really feels like my own now. I'm so lucky I get to wear it for the rest of my life!" Thanks again for all your help! Jennifer P.